Figure 1. chemViz in action. This example shows a portion of a network of predicted hits for a chemical assay. A 2D Structure Table has been generated for the selected nodes, and the number of hydrogen bond acceptors and donors for the compounds have been calculated and added to the table. Larger images of two of the structures are shown. The calculated hydrogen bond acceptors and donors were mapped to Cytoscape attributes by chemViz and used to set the node color and node border color in the network. 2D structures for the compounds have been painted directly onto the nodes. UCSF chemViz is a Cytoscape plugin that extends the capabilities of Cytoscape into the domain of cheminformatics. 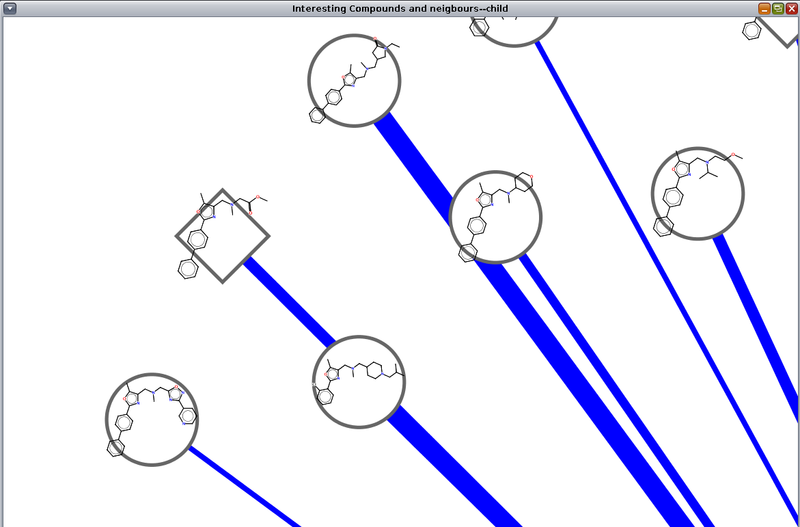 chemViz displays 2D diagrams of compounds specified by InCHI or SMILES strings. 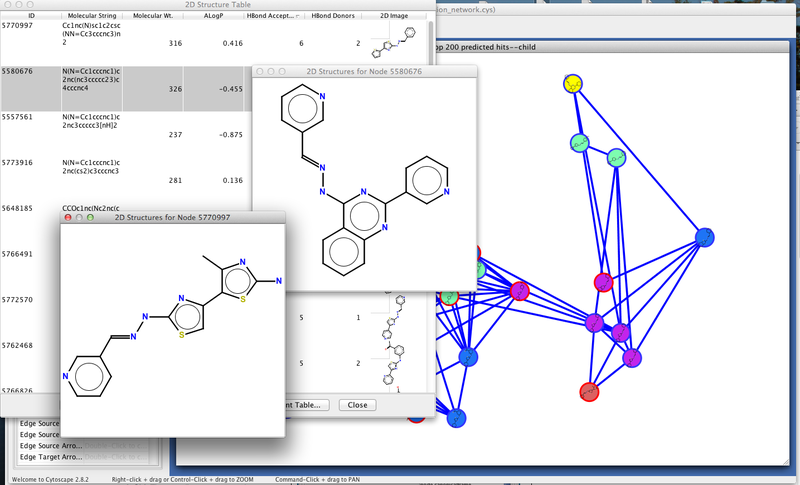 chemViz can also calculate Tanimoto similarities of compounds and use the values to create chemical similarity networks. Part of such a network is shown above. The 2D diagrams can be presented as scalable independent windows or as part of a table also showing Cytoscape attributes and calculated compound descriptors, including number of hydrogen bond donors, number of hydrogen bond acceptors, molecular weight, ALogP, molecular refractivity, number of Rule of Five violations, and several more. Any of the calculated descriptors can be mapped onto Cytsocape attributes where they can be used by the VizMapper and saved with the session. In the network above, nodes are colored by the number of hydrogen bond acceptors and node borders are colored by the number of hydrogen bond donors. chemViz depends on version 2.8 of Cytoscape and is available from the Cytoscape plugin manager or at http://www.rbvi.ucsf.edu/cytoscape/chemViz. This page describes chemViz release 1.3.
chemViz is available through the Cytoscape plugin manager or by downloading the source directly from the Cytoscape svn repository (see Cytoscape Subversion Server information, or browse the csplugins/ucsf/scooter/chemViz sources). To download chemViz using the plugin manager, you must be running Cytoscape 2.8 or newer. chemViz is available in the Analysis group of plugins. To install it, bring up the Manage Plugins dialog (Plugins→Manage Plugins) and select Analysis under Available for Install. Select chemViz and click the Install button. chemViz functionality is available through a "global" menu under the Plugins and as either node or edge context menus. In any of the cases, chemViz provides a Cheminformatics Tools submenu. Chemical information is appropriate on either edges or nodes, so the global submenu provides submenus that allow the user to indicate whether the action should be performed on all nodes, all edges, selected nodes, or selected edges. The selected nodes menu will only appear if nodes are selected. Similarly, the selected edges menu will appear only if edges are selected. The all nodes and all edges menu items will always appear, but will be disabled (grayed out) if chemical information is not detected on any or the nodes or edges, respectively. Obviously, the chemViz node and edge context menus only apply to nodes or edges, as appropriate, and most items will be disabled (grayed out) if no chemical information is detected on any of the selected nodes or edges as appropriate. The exception to the above discussion is the Settings... menu, which has no submenus since its only function is to bring up the settings dialog. The settings dialog is discussed in more detail in the next section. The first step in using chemViz is to adjust the settings to correspond to your network attributes. By default chemViz will look for SMILES strings in the Cytoscape attributes: SMILES, Smiles, smiles, Compounds, or Compound. InCHI strings will be searched for in the attributes: InCHI, inchi, InChi, or InChI. These attributes may contain Cytoscape lists or comma-separated values. Either of these settings can be overridden through the Settings... dialog (see Figure 2). The Settings... dialog can also be used to change the default cutoffs for creating similarity edges and restricting the number of compounds to show in a single 2D popup. Each of the settings is discussed briefly below. chemViz has three ways of displaying the 2D structures corresponding to SMILES or InCHI strings. For multiple nodes or edges or for nodes and edges with large numbers of compounds, the easiest way to view the compounds is with a table that includes not only a 2D representation of the compound, but also information about the node or edge associated with the compound or calculated chemical descriptors such as the molecular weight. The second way is to display the compound structure directly on the node. The final way to display compound structures is as a small popup with just the selected structures displayed. If the number of structures is large, this popup can be very slow and the structures so small as to be unusable. The value in this field is used to limit the number of 2D structures included in a popup. When using chemViz to create a new network or new edges based on the similarity between two compounds it is customary to choose a reasonable minimum value to consider for the creation of an edge between two compounds since drawing an edge between two dissimilar compounds may not be useful for either analytical or visualization purposes. chemViz supports a number of different fingerprints that may be used for computing similarity. The default fingerprint is the Pubchem, alternatives include MACCS, CDK, and Extended CDK. SMARTS based substructure fingerprint based on Chemical substructures that enrich for biological activity [Klekota, Justin and Roth, Frederick P., Chemical substructures that enrich for biological activity, Bioinformatics, 2008, 24:2518-2525]. Many of the chemViz operations will use multiple cores if they are available. This option limits the number of threads (cores) that may be used simultaneously. A value of 0 will use the number of cores minus one. Select the list of attributes that chemViz will use to search for SMILES strings. Node or edge attributes can be selected from the list. This is a multiple-selection dialog, so multiple attributes can be selected by holding down the Control key. 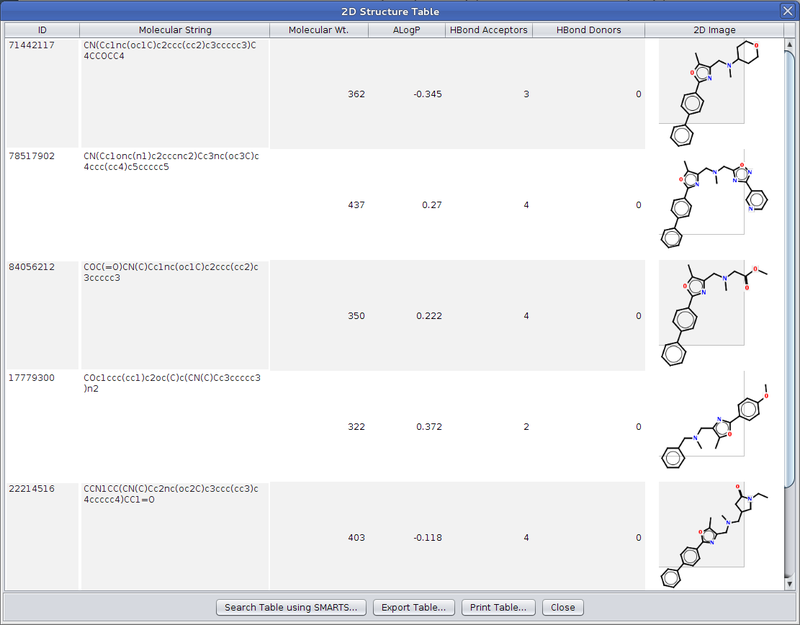 Select the list of attributes that chemViz will use to search for InCHI strings. Node or edge attributes can be selected from the list. This is a multiple-selection dialog, so multiple attributes can be selected by holding down the Control key. By default, when chemViz paints 2D depictions of compounds onto the nodes, the size of the depiction is approximately the same size as the node (100%). Adjusting this value will change the size of the 2D depiction in relation to the size of the node. 2D depictions of structures that are painted onto nodes are postiioned at the center of the node. This options allows this default to be changed to paint in some other quadrant in relation to the node. For structure windows that contain more than one structure, either because more than one node is represented or because there is more than one compound in a given node, chemViz will add a label in the window. This option allows the user to select a different attribute to use as the source for this label. By default the ID is used for the label. As mentioned above, there are three ways to show the 2D representation of a chemical compound using chemViz: the 2D structures popup, painting structures directly onto the nodes, and a 2D structure table. Each of these approaches is discussed below. Figure 3. The 2D Structure Table showing five structures from nodes in a Cytoscape network. By resizing the popup frame, users can scale the structural representations. By default, the Lipinski descriptors are shown. The most flexible way to display 2D structures and corresponding attributes and descriptors is through the chemViz 2D Structure Table. This dialog displays a table which can include Cytoscape attributes, molecular descriptors, and the 2D depiction of a compound. A 2D Structure Table may be displayed for single node or edge, a group of nodes or edges, or all of the nodes or edges in the network. The 2D Structure Table may be displayed for a single node (or edge) or the currently selected set of nodes or edges using the node or edge context menu: Cheminformatics Tools→Depict 2D Structure→Show table of compounds from selected nodes(or edges). 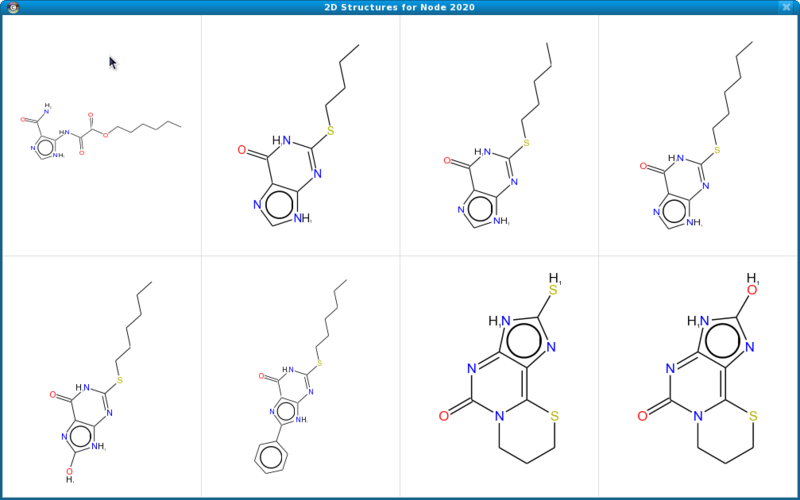 They can also be displayed using the main plugin menu: Plugins→Cheminformatics Tools→Depict 2D Structure→Show table of compounds from selected nodes(or edges) or Plugins→Cheminformatics Tools→Depict 2D Structure→Show table of compounds from all nodes(or edges). Using any of these menus will bring up a table with default columns: ID - the ID of the node or edge, Attribute - the Cytoscape attribute used to retrieve the SMILES or InCHI string, Molecular String - the SMILES or InCHI string, Molecular Wt. - the molecular weight of the compound, and 2D Image - the 2D depiction of the compound. As with the 2D structures popup discussed above, the table may be resized as can the individual columns in the table. Columns may be reordered by dragging the column headers, and clicking on a column will cause it to sort the table based on the values in that column (clicking again will reverse the sort order, and a third click will remove the sort). Double-clicking on a single 2D image will popup a 2D structure popup with only that structure. A 2D Structure Table may be customized further by right-clicking on any of the column headers. This will bring up a context menu for that column which allows users to remove the column from the table (Remove Column), or by adding a new column using data from corresponding Cytoscape attributes (Add New Column→Cytoscape attributes→) or calculated molecular descriptors (Add New Column→Molecular descriptors→). See the section below on Calculating Molecule Descriptors for a list of possible descriptors. This capability allows molecular descriptors, cytoscape attributes and 2D depictions of the structures to be displayed in a table, sorted, and compared. Selecting any row in the table will select the corresponding node or edge. Similarly, selecting any node or edge that is represented in the table will select the corresponding rows in the table. Allows the user to enter a SMARTS query and searches all compounds in the table for matches. Rows that contain matching compounds will be selected (which will also select the corresponding nodes or edges in the network). Figure 4. The 2D Structures Popup showing six structures from a node in a Cytoscape network. By resizing the popup frame, users can scale the structural representations. The 2D structures popup may be displayed for any node or edge with either SMILES or InCHI attributes using the edge or node context menu: Cheminformatics Tools→Show structure window(or edge). This will bring up a dialog with 2D representations for all of the compounds described by the SMILES or InCHI strings associated with that node or edge. The popup is resizable and the 2D structure representations will scale to match the size of the popup. Figure 4 shows the result of requesting the 2D structures popup for a node with 6 structures annotated. In additional to using the context menu, the 2D structure popup is available by double-clicking on a 2D structure in the 2D structure table (see above). Figure 5. The 2D Structures Painted onto Nodes showing six structures from a node in a Cytoscape network. By resizing the popup frame, users can scale the structural representations. The final way to display chemical structures is by painting a 2D representation of the structures directly onto the nodes in a network. This may done from either the main menu or the node context menu. In either case, the menu Cheminformatics Tools→Paint structures is used to add the structures to the nodes. The main menu will allow all nodes to be painted as well as just the selected nodes. The node context menu only allows selected nodes to be painted. By default, the 2D structure depictions are positioned in the center of the node and are roughly the same size as the node bounding box. These defaults may be changed by adjusting the Position of the 2D depiction on the node and Size of 2D node depiction as a % of node size settings, repectively. Once a 2D structure depiction is painted on the node, it is governed by all of the normal Cytoscape rules for node graphics. If the network zoom is changed, the depiction will be updated to reflect the new zoom value. In addition, exports of the network view will contain the structural depictions also. These depictions are drawn using vector drawing primitives, so exporting a network view using PDF will preserve the ability to zoom the document without any loss of resolution. One other point to note about the painted structures. By default, the algorithms in CDK that draw structures are very careful about drawing the atom labels in a way the the bonds are occluded. This is done by setting a background color for the font. chemViz attempts to mimic this behavior by setting the background color of the font to match the node fill. At times this may require the color of the node to change or otherwize be modified to improve the readability of the structure depiction. To remove the structure depictions from nodes, use the Cheminformatics Tools→Remove structures in either menu. If changes are made to the settings or the structures themselves, if may be necessary to remove and repaint the structures. This is the set of parameters most often associated with Structure Data Format (SDF) files: XLogP, Topological Polar Surface Area, and Zagreb Index. This is the square of the ALogP value - i.e. ALogP2. The total exact mass of the molecule, assuming the "standard" isotope for each element. The total number of non-hydrogens in the compound. The maximum length over breadth value. The minimum length over breadth value. The number of Lipinski "Rule of Five" failures calculated for the structure. The number of rings in the compound. The 2D estimated tpological polar surface area based on fragment contributions (TPSA). The number of bonds in the structure. The Wiener path number: half the sum of all atom distances in the structure. The sum of the squared atom degrees of all heavy atoms. As mentioned above, chemViz can be used to add values for molecular descriptors to a 2D Structure Table by using the Add New Column→Molecular descriptors→ context menu that is available on the column headers. In addition, the node or edge context menus and the Plugins→Cheminformatics Tools menu contain a Create attributes from molecular descriptors menu. Executing this menu will create new Cytoscape attributes and calculate the appropriate values for the compounds associated with the nodes and/or edges. As network get increasingly complex, it might be useful to search the network for compounds that contain some substructure. This is done using SMARTS queries by selecting Cheminformatics Tool→Search compounds using SMARTS in either the context menu or the Plugins menu. In either case, the user is prompted for a SMARTS query and the network is searched for matching compounds. The nodes or edges that match the query are selected. Given a group of compounds, a useful operation to determine the maximum common substructure of all of those compounds. This may be useful, for example, to suggest important common structural elements of compounds that might be biologically active or those that might not. chemViz provides this capability with the Cheminformatics Tools→Show Maximum Common SubStructure menu items in both the Plugins menu and the context menus. chemViz will iteratively step through all of the compounds of the network, or selected nodes and edges and popup a structure window that shows the MCSS. The SMILES string the MCSS is shown in the bottom of the window and the text is selectable for copy/paste operations. In addition to the ability to popup a structure window, the node context menu has an additional menu item: Cheminformatics Tools→Create MCSS group from selected nodes. In order to be useful, the metaNodePlugin needs to be installed also. If it is, this menu item will calculate the MCSS and create a metanode containing all of the selected nodes. The compound attribute for that node will contain the SMILES string of the MCSS. A common task for cheminformatics tools is to calculate the similarity of two compounds. The usual mechanism to doing this is calculating the Tanimoto coefficients between the two compounds, which is a measure of the similarity of the two compounds based on the angle between the attribute vectors (fingerprint) of each compound. Thus this measure is dependent on the specific fingerprint descriptor used. Common descriptors are MACCS, PubChem, and Daylight. The CDK used a 1024 bit hashed fingerprint, which ignores cyclic systems. 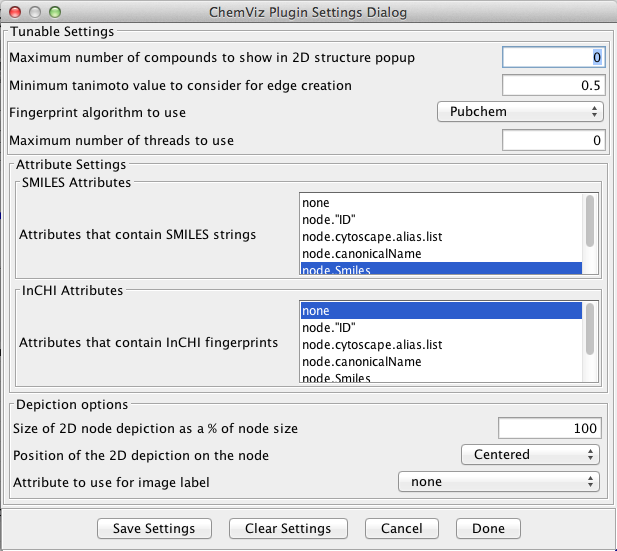 chemViz provides In addition, both the node or edge context menus and the Plugins→Cheminformatics Tools menu contain a Create Similarity Network submenu. If no nodes are selected, the Tanimoto coefficients for all nodes are calculated and a new network is generated with an edge between all node pairs where the Tanimoto coefficient is larger than the Minimum tanimoto value to consider for edge creation setting from the Settings Dialog. If more than one node is selected the Tanimoto Coefficients menu becomes a submenu with two options: for all nodes and for selected nodes. In either case, a new network is created with the edges representing the Tanimoto similarity. To aid in determining the specific compounds, the original positions of the nodes are retained in the new network.